Once upon a time - hundreds of millions of years ago - changes in the climate brought changes to the environment. Deserts, swamps and inland seas covered the area, alternately, for hundreds of thousands, if not millions, of years apiece. With each new environment a new layer of sediment was deposited on top of the previous one. The weight from each new layer pressed and compacted the ones below so that minerals could do their job and cement each layer into rock. Tectonic plates, blocks of the Earth's crust, were important too. When the Kula and Farallon plates slid under the North American plate 75 million years ago the movement forced the land to uplift creating the Rocky Mountain range. A similar movement 60 million years later formed the Colorado Plateau. 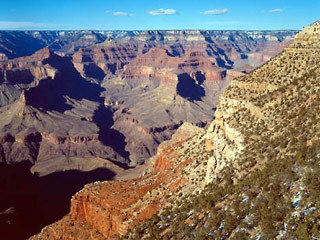 The first uplift created the Colorado River giving erosion, the movement of rock and soil, its beginning. The second increased the Colorado's already steep slope causing the river to flow faster and erode quicker. But it wasn't until the Ice Ages, little more than 2 million years ago, that the Colorado River did most of its work. During this period of the Earth's history the Colorado ran high from snow and rain carrying more rock and soil than ever before. But for the Grand Canyon to look as it does today one last thing had to happen. One million years ago or so a volcanic field erupted to the north spewing ash and lava on the Grand Canyon's west rim and creating its last layer of rock.